Urticaria, also known as hives or welts, is common skin reaction to one of many triggers. It appears as raised, red, and intensely itchy wheals that usually recede within hours or days. 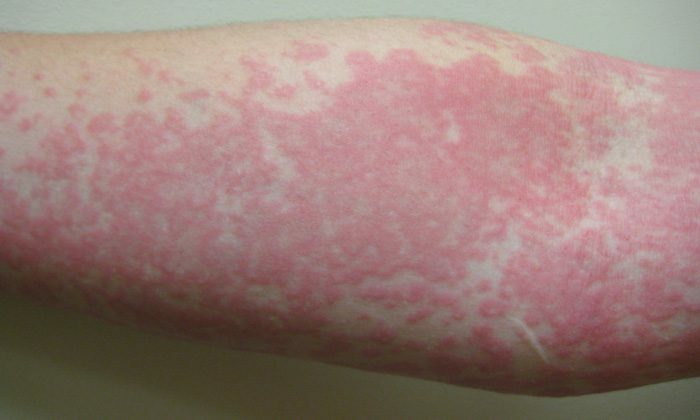 Rarely these lesions persist beyond six weeks, in which case they are defined as chronic urticaria. 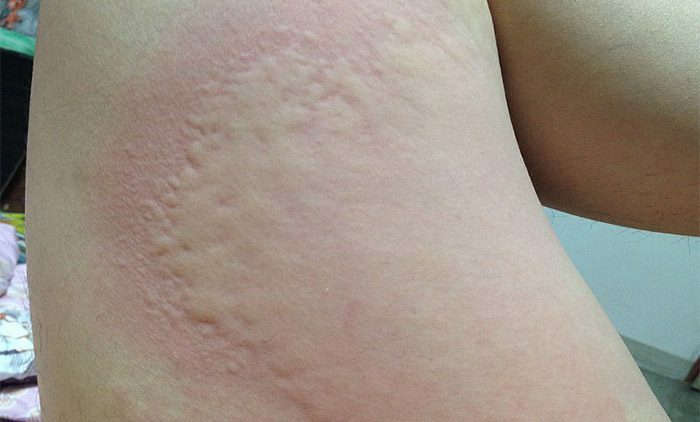 Hives are not life threatening but may rarely precede allergic anaphylaxis – a medical emergency – though in the vast majority of cases urticaria does not require immediate medical attention. These welts can be unsightly and extremely itchy, however, and treatment is typically very effective. The gold standard for treatment of urticaria is a combination of identifying and avoiding triggers and antihistamines. This alone almost always resolves the lesions but in more severe or treatment-resistant cases oral and injectable steroids may complement the antihistamines, as do leukotriene-receptor antagonists and immunosuppressants. Most of these treatments are reserved for cases of chronic urticaria. There exist a huge number of potential triggers for urticaria. It can be an allergic reaction to food such as peanuts or shellfish, medications such as penicillin, or contact with an irritating substance. Some medical conditions can trigger urticaria including certain bacterial infections such as strep throat, viral infections such as herpes simplex, epstein-barr, hepatitis A, B, and C, cancers of endocrine tumors and any other condition that can cause large hormonal imbalances such a hypothyroidism, hyperthyroidism, and even pregnancy, lymphoma, and cancers of the immune system such as leukemia. Urticaria can be triggered by physical factors including cold, heat, sunlight, pressure, water, minor trauma, and exercise. Finally, urticaria can simply be the result of emotional stress. Consult your dermatologist for evaluation and treatment if you believe that you suffer from urticaria.